The Lady Vols suffered a shocking second round upset Sunday, losing a home NCAA Tournament game for the first time ever 66-59 to Oregon State. The Lady Vols made history in Knoxville Sunday, but not in a fashion they want to remember. 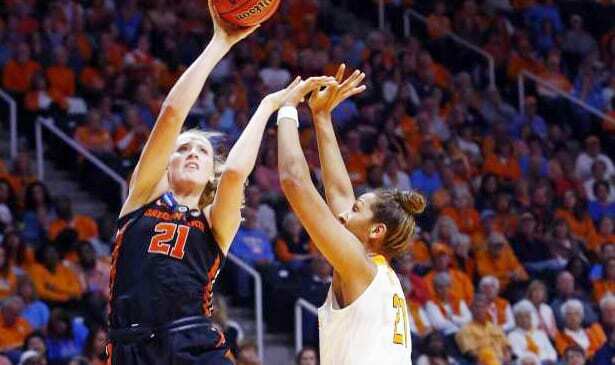 Oregon State, a number six seed, stunned the number three seed Lady Vols 66-59, knocking them out of the NCAA Women’s Tournament in the second round. It was both the first time the Lady Vols have lost an NCAA Tournament game on their home floor, and failed to advance beyond the second round for two straight seasons. Oregon State survived a dismal opening quarter that saw them commit six turnovers and only score nine points. Things weren’t much better in the second, as they only scored 15. But Tennessee’s offense never warmed up. They scored only seven, and thus were just ahead at halftime 26-22. Then the wheels completely came off in the second half for the Lady Vols. They only got 33 points the final 20 minutes, and just 13 in the third quarter. Though neither team shot well, Oregon State made nearly 46 percent (45.7) of its shots from the floor to barely 34 (33.7) for Tennessee, with both teams shooting miserably from three point territory (26.3 for Oregon State, 22.7 for Tennessee). Mercedes Russell made her final game for Tennessee a memorable one with 21 points and 14 rebounds, but didn’t get much help. She completed her Tennessee career second only to Chamique Holdsclaw in double doubles. Mikalayn Pierce had 18 for Oregon State, while Marie Gulich added 14 points and 12 rebounds. Tennessee ended the season 25-8. Oregon State moves on and is now 25-7.